Veechu Parotta is a popular layered flatbread from Tamil Nadu similar to the regular maida parotta except for the method it is cooked. Veechu means Veesu or throw in Tamil and the way this parotta is made by throwing the rolled out dough and gathered gets the name. The ingredients of this parotta are also the same as regular Parotta, which is referred as surul or spiral parotta. This has the same flour, oil, water, and salt, including the kneading and standing part. The difference calls in the folding after the veechu / veesu / throw of the parotta and cooked. This was one of the first letters I decided, and until the day I was editing the pictures, I didn’t even realize I have already done it! Can you believe it? I was shocked and just didn’t know what to do. I got my own recipe for Veechu Parotta in the google search and I was like, what the! I would’ve been able to do something else at the last moment of course. The only standing grace is that my previous recipe proportion is different from this one! I adapted this recipe from here and all I could think of was making it, without realizing I already have it. The other choice for the alphabet was using Vatana which is Peas in Marathi and coming up with the various combination. I rather decided against it. This Parotta dough is what I make for my Poli as well and mostly use milk and ghee to knead the dough. It is later soaked in oil for nearly 3 to 5 hours before making it. The longer it stands, the flakier you get the parotta. The measurement given below gives about 15 medium sized parottas. So Veechu Parotta is my choice for V, in the AtoZ Flatbread and More, where I am doing AtoZ Indian Flatbreads. 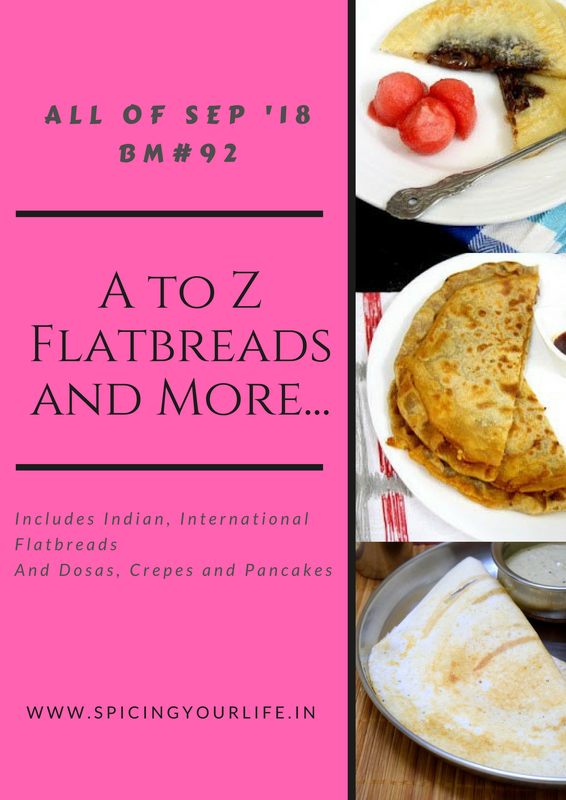 If you eager to know what’s V in AtoZ Dosa Varieties, hop over! 1/2 cup Cooking Oil for smearing and rolling out the balls. Take the flour in a bowl, add salt, ghee, and half the milk. Mix well and slowly add the milk to get a dough. Finally, add the oil and knead again. The dough has to be loose. Pour about 2 tbsp oil over the dough and keep it covered in with a cloth. Let it rest for 3 to 5 hours. If you can manage for 2 hours is also fine. After resting, take the dough out and knead on a smooth, clean oiled surface. Pinch out into equal sized balls with your fist. Apply oil and get this done. Once the balls are all made, smear oil over them. Roll out each into thick pooris smearing oil liberally. Stack them aside. Roll out pooris as thin as you can. The dough will spring back in. Pull it out again. Now comes the ‘Veechu’ part. Take the rolled out disc and throw it out forward. Doing this couple of times will get you thin sheet like layer. Once you feel the layer is thin enough, fold inwards from opposite sides and on the sides as well. You will end up having a rectangle. These flatbreads tend to get chewy, so its best to cook them right away and serve. Heat a tawa and when hot, cook the parotta on both sides, drizzle oil over it. Once the parotta is cooked, return them to your oil smeared counter. Clap the parotta with your hands to separate the layers. Now comes the 'Veechu' part. Take the rolled out disc and throw it out forward. Haha… what a way to realize you already had a recipe on the blog! The parotta sounds totally delicious… I am going to pin this up for sure! That would have been fun to google a recipe and find your own blog in the results! This parotta looks super delicious and so flaky. Hats off to you that you made it so thin that too without eggs. Fabulous Valli!! Veechu parotta is literally inviting me to enjoy with some spicy salna, parotta looks incredibly prefect and dangerously addictive. My husband would love to enjoy this parotta rite now for his dinner. It happens so many times that I realize I had already posted it in the blog. So now the standard protocol is to check the blog first and make it 🙂 This one sounds so rich and inviting. Ah ! I can imagine your state when you found your own recipe in search ! This has happened with me too ! The paratha sounds very interesting , and I am waiting eagerly to get into my kitchen to make some . It might take sometime to do that but will definitely try it . The recipe is very interesting and the paratha looks super delicious ! Hahaha, that is quite funny Valli. This can happen only in our group. We make so much recipes, we forget what we made. Lol. Veechu parotta is my favourite. I love that crispy parotta to the soft regular ones. Great pick with V and unique bread for me.. love the flaky and crispy bread with any curry. That’s really funny.. realizing that you’ve already got a recipe on your own blog, it happened to me once till a follower pointed out! Veechu parotta looks so soft and flaky, its so similar to the Sri Lakan one but that one is folded several times. Haha! Same thing happened to me once and it was the same recipe I was going to post so had to abandon it and make something else!! With so many recipes on the blog, it is only natural that we forget what we have posted!And this Veechu parotta has come out so well Srivalli. I also thought to make it but later dropped due to maida. looks great and yeah it has some trick to fold and cook. Same pinch Valli! I made the same for the alphabet V and the kids loved it. For me, I was on a APF overload and I was just wanting to get it done. The veechu parotta looks very tempting now and after seeing yours, I am craving to make some again.